What's this? Two reviews in one night? I'm a friggin' machine! Next up is a little film that appears to be just another cheezy killer snake film, but it's way more than that. The dvd cover is kind of scary. Kinda feels like that snake is just going to jump out of the computer screen and bite your eyeball. Maybe it's just me. Venom is a film that has two things going on at the same time. The movie takes place in England and is about a boy who is kidnapped/held hostage by his chauffeur, maid and some German guy. At the same time though, the boy's harmless, new, pet snake that he just picked up that day from a local animal store was accidentally switched with a Black Mamba, the most poisonous snake in the world. Once the kidnappers find out about the snake (which naturally gets loose in the house), their plot starts to turn sour. 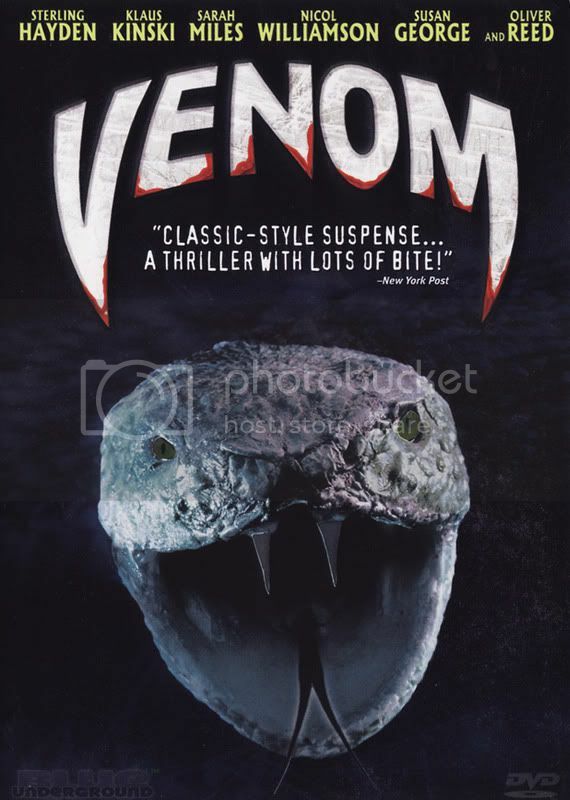 Venom was directed by Piers Haggard, who replaced original director Tobe Hooper (Texas Chainsaw Massacre), and featured a cast of well known stars, including Klaus Kinski (Herzog's Nosferatu), Oliver Reed (Gladiator) and Susan George (Straw Dogs). There was a lot of tension during the scenes with the snake and some good scares, but overall the movie is just a little two slow. The cast is great though especially Oliver Reed, one of my new favorite actors. Blue Underground's dvd release is really nice with a director commentary and trailers. The transfer of the film is crystal clear and Michael Kamen's musical score helps build tension. Overall, the film has originality and really only suffers from it's slow pacing. It would have been nice to have seen the snake more in the film as well.